If you intend to taste the delicious lobster in Pengerang, it's better to stay in Sungai Rengit overnight to avoid the danger of traveling at night. 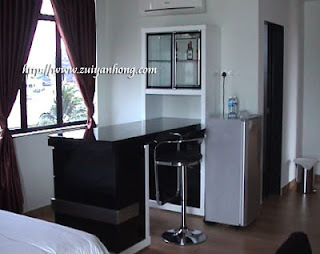 Talking about lodging in Sungai Rengit, Tai Hoe Hotel is one of the best choices. Since Taiwan Kuo Kuang Petrochemical Technology Co has invaded Pengerang, this small peaceful town located in the southeastern tip of West Malaysia immediately exposures to the world. Environmental organizations from whole Malaysia showed up in Pengerang to support Pengerang villagers against the implementation of the Kuo Kuang Petrochemical project. During my lobster trip to Pengerang in May, I stayed in Tai Hoe Hotel at Jalan Siakap, Sungai Rengit. Pictures don't lie. The surrounding of Tai Hoe Hotel is quiet and the rooms are clean as well as spacious. Apart from Tai Hoe Hotel at Jalan Haji Abu Bakar, the new Tai Hoe Hotel is at Jalan Siakap facing South China Sea. Super Lobster Restaurant is at the ground floor of new Tai Hoe Hotel. The ground floor of the old Tai Hoe Hotel is a mini market and the hotel reception counter is there. Provided with wifi, new Tai Hoe Hotel is customized to suit the needs of bow tribe or screen generation to connect with the world. Beyond that, the invincible sea view and comfortable guest rooms of new Tai Hoe Hotel are certainly the favorite of the visitors of Pengerang.